The timeless beauty of the American jewel-style opalescent glass window has captured the public's attention for over a century. Throughout the late 1800's and into the 1900's, thousands of beautiful stained glass windows were created using a new material: American opalescent glass. The use of this new glass, based upon white or opaque glass rather than clear or transparent glass, was championed by the likes of Louis Comfort Tiffany and John LaFarge. You can still find these magnificent windows throughout the United States and Canada: in churches on the prairies, in public spaces such as libraries and university buildings, and in the grand private residences of the nouveau riche of the day. 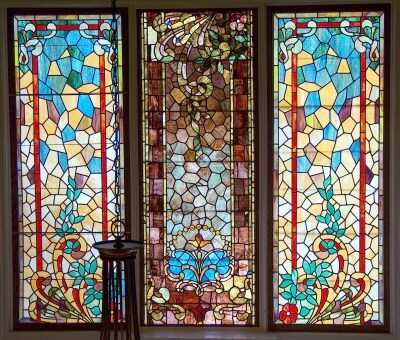 Anyone who has visited the Bishop's Palace in Galveston, Texas or The Mark Twain House and Museum in Hartford, Connecticut has enjoyed looking at these grand masterpieces of stained glass. My new collection American Jewels features the same look of these glorious opalescent windows. They feature colorful opalescent glass, mixed with frequent interplay of brightly colored jewels and bevels. Some designs in the collection are as lavish, serpentine and outrageous as the original windows in the grand palaces that inspired them. Others are more on the restrained and sophisticated side, featuring arches and thin ribbons of color along with bursts of colorful jewels. Others evolve into the strict geometric themes of Art Deco sensibilities, and feature clean, straight lines and square/rectangle themes. For this Design of the Month, I have chosen to feature a design I did for a private residence in Denton, Texas. My client had purchased an antique American jewel-style window from an antiques dealer many years previously. When they moved to a new, contemporary home, they brought the large window with them, and decided to place it in their west-facing grand stairway landing room. This room has six clear insulated glass windows: three stacked on top of three. 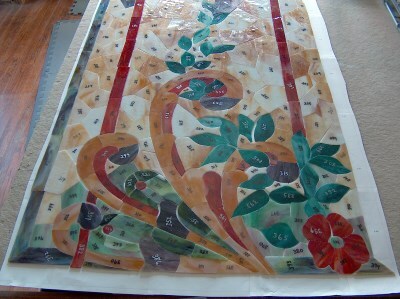 The antique stained glass panel was installed in the middle-top section. I was contracted to create two flanking stained glass panels in a similar style to the original, but the clients did not want a copy. They wanted something "inspired" by the look of their American jewel, so I created mirror-image panels, drawing from some of the design elements in their original panel. I constructed the two panels using a mixture of 7/32" H-lead for the majority of the interior, 3/16" H-lead for the tighter curved pieces, and 1/2" H-lead for the perimeter. Steel rebar was added every 12" or so, matching the rebar plan in the original panel. As with the original, these two new panels were framed in 3" oak, with a dark stain to match the original panel's frame. The original panel was a mixture of high-textured cathedral and opalescent glass, but I decided to use mostly opalescent glass for my two panels to give better sunlight and heat control. After finishing the two panels, my assistants and I carted them over to the job site. We erected two heights of interior scaffolding in order to reach the installation site safely. With a little judicious sanding, and some sturdy nails and screws, the two windows were successfully installed on either side of the original panel. The result is a trio of American jewel-style windows, providing sunlight and heat control for the interior, as well as adding a dramatic and colorful statement in an otherwise plain area of the home. I photographed the completed installation from the top of the second-story stairs, looking out towards the west. Please take a look at the entire American Jewels collection of designs. I am certain there will be quite a few that will delight you and your clients. 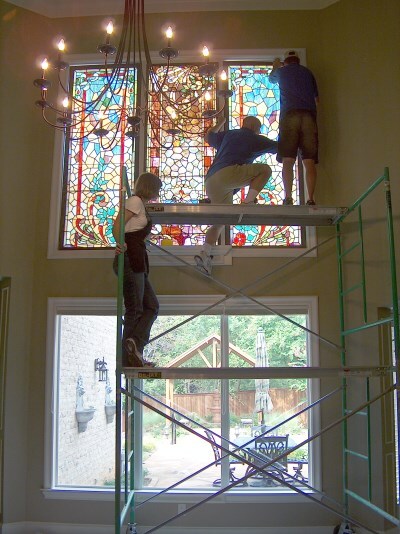 Christie Wood is the owner of Art Glass Ensembles, a full-service stained glass studio located in Denton, Texas. 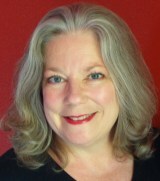 Christie serves on the board of directors of the Stained Glass Association of America and has several CD-ROMs of designs available in Glass Eye 2000 format. In June 2011, Christie launched a new business called Green Planet Glass which specializes in giftwares manufactured entirely using glass recycled from larger Art Glass Ensembles projects.